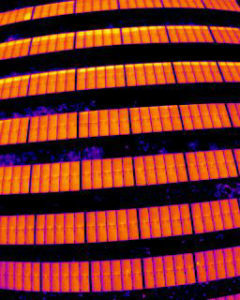 For photovoltaic plant inspections, aerial thermography via UAVs offers unmatched advantages. 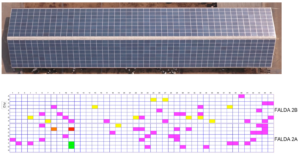 Within a few hours, it is possible to analyze thousands of panels and for each one to establish their efficiency or defective conditions. Failures are classified by extension and severity to allow the customer to evaluate the appropriate corrective actions. The final report, included in the service, contains the details of all damaged panels and the global map that makes it easy to identify the panels to be replaced. In the case of brand new plants, the thermographic test at the time of the final check gives the customer evidence that the plant is working perfectly. 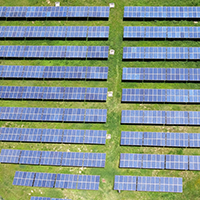 Photovoltaic plant in Piobesi (near Turin) of about 800 KWatt. The plant, located on the roof of several buildingss, is hardly reachable by the maintenance staff. Six plants, about 1 MWatt each, monitored in the province of Cesena. The plants are located on the ground, on a hill, sometimes steep.